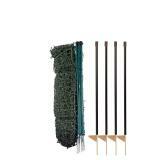 A very popular netting kit for folks who simply want to keep small critters out of their gardens. The netting is short enough to step over (when un-energized). 20" tall. 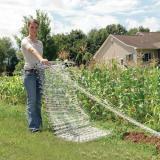 Just add an energizer to fit your fencing situation. Most gardens (200–300 ft fence line) need an energizer (see accessories tab below) with at least 0.5 joules output. 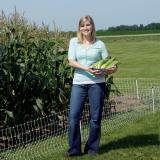 Keeping rabbits, woodchucks, raccoons, small dogs, geese, wild pigs, opossums, skunks out of gardens and sweetcorn. Also good to protect beehives. 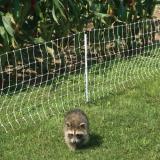 VersaNet® Plus 9/20/3 is a 20" electrifiable prefabricated fence. 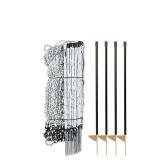 It arrives at your door as a complete roll with the single spike posts already built into the mesh/fence. 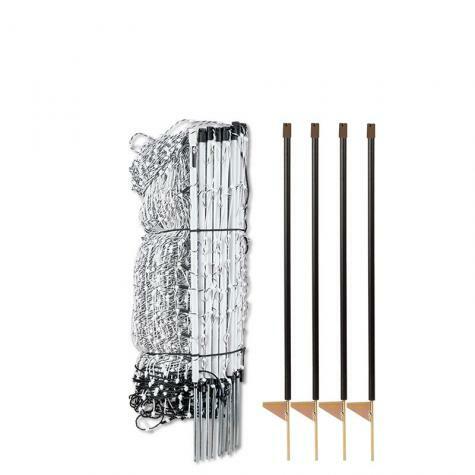 Features 9 horizontals strands (8 conductive) with vertical struts placed every 3". “Plus” nets include additional line posts spaced every 6'8" to reduce sag. Add more rolls for a larger enclosure. FiberTuff™ Posts provide additional support around curves, corners and other major directional changes. 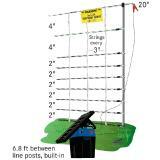 Use at end posts to help maintain tension on the fence. Just push the posts in by hand. The built-in posts are usually strong enough for ends or corners--if you move the posts within the fence. Remember...netting must always be properly electrified! See PDF above for more information. This is a pain barrier, not a physical barrier. We have used Premier's electric netting for the past two years for our goats and chickens with great success. 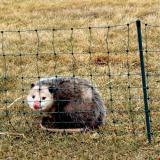 We expect this scaled-down version will keep rabbits, raccoons and the possums out of our gardens just as effectively as it keeps our livestock in. Easy to set up, and looking forward to a pest-free garden this year. Fast shipping, great customer service. If you don't know exactly what you need for your electric fence setup, they'll help! I bought this along with the solar charger and received it within only a few days. Installing the fence was a dream I had 200 feet of it in place in less than half an hour no more visitors to my garden since, besides myself. Wish I had done this years ago.